Whatsapp is currently working on a new app called Small and Medium Business. This app is designed for every business man or woman on Whatsapp; and will be made available for Android, iOS and Windows Phone platforms. If you own any business, then this app is made specially for you. 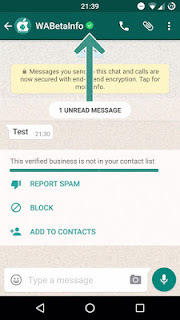 You'll need to install this Whatsapp business app on your smartphone in order to benefit all business features that WhatsApp was working on for the past years, while you still have the normal WhatsApp on the same smartphone. Yes, you can install the Whatsapp business app while the normal Whatsapp is still installed on your phone. 5. Two types of business account will exist, Verified and Unverified Business Account. Verified Business: its name is directly verified by WhatsApp. When a business is verified, you will see a green badge next to its name. 6. A business has to also insert its website and email address in its info, in order to have a very detailed profile that users can view. 7. Your business WhatsApp will contain detailed statistics since they have installed WhatsApp, for example how many sent messages have been read and successfully delivered. If you are a business man or woman, be ready for the app is launching soon. Wow. Whatsapp is really growing. Am sure Mark will be thanking his star he bought them. This is a great concept. Nice idea, thanks for sharing this information will us. This is technology advancement, this would help a lot.